The Halloween franchise makes its return to the big screen this year, thanks to the folks at Blumhouse Productions and director David Gordon Green. One of the best parts of that, for horror fans, is all of the new merchandise that comes along with it. 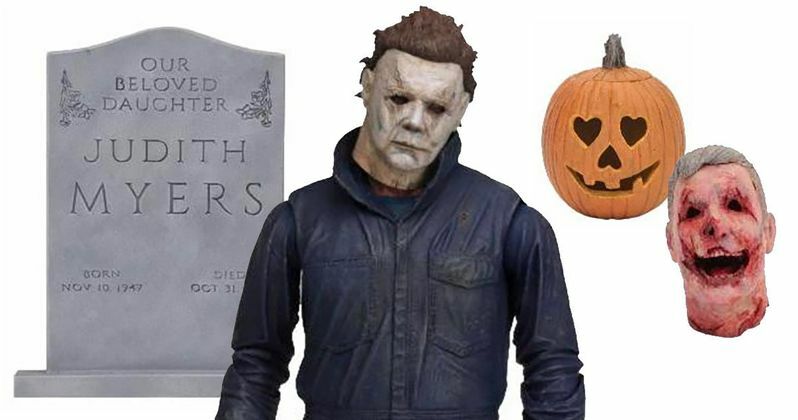 In this case, National Entertainment Collectables Association (NECA) has revealed their new Michael Myers action figure, which looks like it could be a must-have for horror fans to add to their collection. This figure is based on his appearance in the new Halloween movie, which is set to arrive in theaters on October 19. This all new Michael Myers figure stands over 7" tall and has received the ultimate treatment, with over 25 points of articulation and tons of accessories. The Ultimate Michael Myers figure comes with 2 heads, knife, hammer, jack o' lantern, interchangeable hands and more. The figure comes in display-friendly deluxe window box packaging with opening flap. NECA also teases that more accessories for the figure will be revealed, when the time is right. The figure's look, based on the photos, which you can check out for yourself below, is spot on. Nick Castle, the original actor who portrayed Michael Myers and was famously credited as The Shape in the credits of John Carpenter's original Halloween, is back behind the mask for the new movie. This definitely captures his likeness, based on what we've seen from the movie. They also paid a lot of attention to detail with the new mask on the figure, which has aged a lot in the four decades that Myers has been in captivity. Halloween 2018 ignores the events of every sequel and will, instead, serve as a direct sequel to the original, with Jamie Lee Curtis back as Laurie Strode. She's looking to kill Michael before he can kill her. For those who may not be familiar, the National Entertainment Collectibles Association is one of the largest manufacturers of wholesale licensed merchandise in the world. They offer retailers a wide selection of products based on a variety of licenses from movies, TV shows, video games, comic books and more. Some of the franchises they've worked with in the past include Aliens and Godzilla, as well as both Marvel and DC Comics. Their collectibles are incredibly detailed and are crafted with a level of care that fans can appreciate. NECA's new Michael Myers figure is available for pre-order now and is going for $34.99 and that includes free shipping. The figure is set to arrive in November, just after the release of the new movie. Those wanting to pre-order the figure can head on over to Amok Time. The site notes that this figure is intended as a collectible and isn't meant for kids. This is a Michael Myers figure we're talking about, which should make that somewhat obvious, but hey, why not be crystal clear, right? You can check out some photos of the impressive action figure for yourself below.